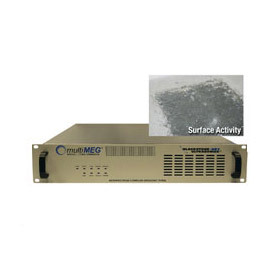 The megasonic generator offered by Blackstone-NEY Ultrasonics is rated at a total capacity of 2400 Watts output (sweeping and non-sweeping) and is built into a package conveniently designed for mounting in a 19" 2U rack. The generator is comprised of two internal modules each producing up to 900 watts of continuous wave output. Each module provides independent impedance and frequency compensation to optimize performance of its segment of the overall attached transducer array. Center Frequencies: 430 kHz or 1.3 MHz (sweeping or non-sweeping). Other frequencies available.